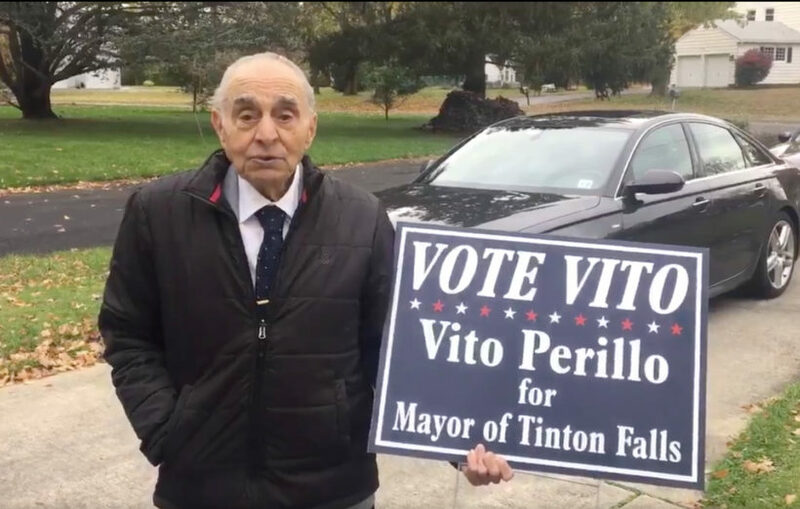 Vito Perillo, the new mayor of Tinton Falls, NJ. (Fox News, Jan. 5, 2018) – World War II veteran Vito Perillo wasn’t about to let age stop him in his quest to become mayor of Tinton Falls, New Jersey. The 93-yer-old wore out his shoes going door-to-door to hand out 7,500 campaign fliers. His successful grassroots campaign led to the stunning defeat of incumbent Gerald Turning in November. Perillo, a former electronics engineer for the U.S. Department of Defense, a U.S. Navy veteran and newcomer to politics, was sworn-in Tuesday. The Bible he used was one that belonged his late wife Mae, who died in 2013. They had been married for 64 years. Perillo said he didn’t think he had a chance of winning but decided to run following a pair of whistleblower lawsuits involving the police department that cost the borough a reported $1.1 million in settlements. Turning was the borough police chief from 2004 to 2011. He was also the borough administrator from 2010 to 2014. As mayor, Perillo will oversee a $24 million budget. He’s also required to attend two monthly mayoral meetings. [Mr. Perillo officially assumed the position Tuesday evening during his swearing-in ceremony. Politics in Tinton Falls are nonpartisan, but Perillo is a registered Republican, according to voter registration records. 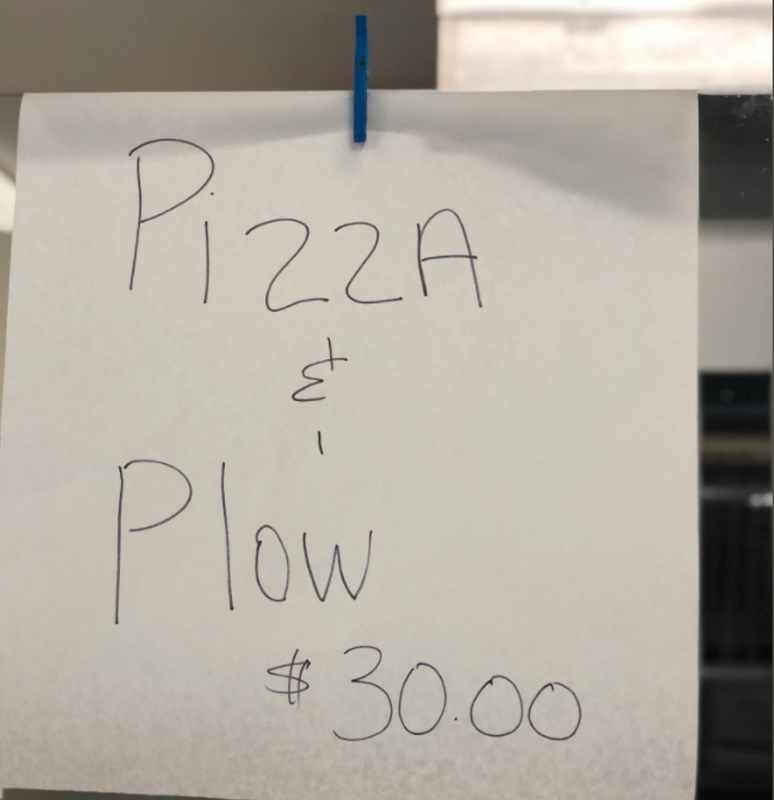 (by Ben Hooper, UPI, Jan. 5, 2018) — A Michigan pizzeria is offering snowed-in customers a “pizza and plow” service that includes delivering a large one-topping pizza and snowplowing the caller’s driveway. Tony Gloriosos, co-owner of Mario’s Pizza in Union Pier, said the increased snowfall inspired him to offer the $30 “pizza and plow” promotion starting last month. “Business was kind of slow. No one wanted to come out. We do offer delivery of course and I’ve been plowing for eight to nine years now. So we decided what better way to offer a pizza than a plow for special price,” Glorioso told WSBT-TV. Glorioso said the promotion has proven popular with hungry residents who find themselves snowed in. “A lady missed her doctor’s appointment. She says ‘thank you so much. Now I can get to the doctor tomorrow.’ She missed one, made it for the next day, very appreciative,” Glorioso said. He said the $30 price for the promotion might change. “Right now we are doing it for $30. So the amount of snow dictates it. If I’m gonna be there a while, we kind of raise the price. If they have, you know — if we’re getting a lot of snow that day,” Glorioso said. The promotion started in late December and Glorioso said he and his wife, Harmony, have now decided to keep it going through the end of winter. “As long as it’s snowing. We’re going to do it all winter long,” Glorioso said. 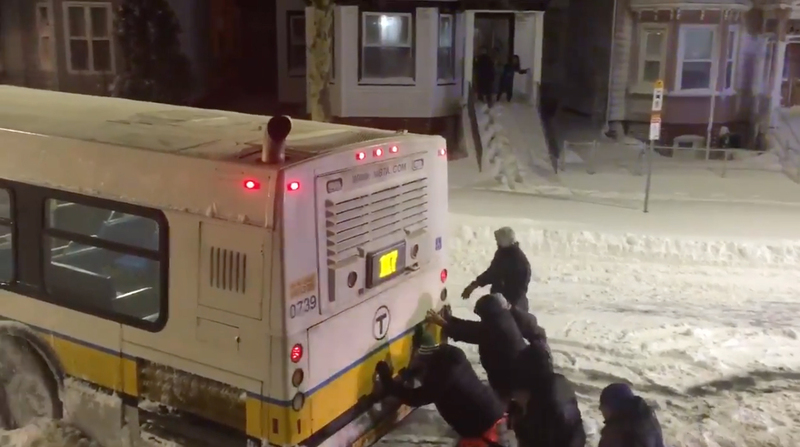 (by Ben Hooper, UPI, Jan. 5, 2018)- A Boston woman captured video of residents banding together to free am MBTA bus that became stuck in the deep snow on their street. Karen Lyons Clauson posted a video to Facebook showing neighbors working to push the stranded bus through the snow on their East Boston street. Clauson said the residents, who had been outside shoveling their sidewalks when the bus became stuck Thursday, used their shovels to create a path for the tires. She said it took about 45 minutes to free the bus, which subsequently became stuck again on the other side of the road. Clauson said freeing the bus the second time went much faster.